Most people sleep for six hours or less each night, according to a survey of 1,600 respondents. If you’re getting less than seven to nine hours of sleep, you’re probably not getting enough rest to manage your chronic back pain. 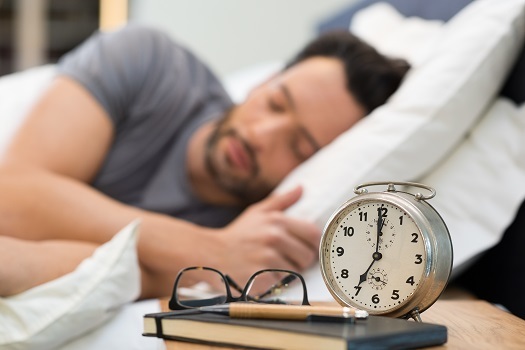 When you don’t get enough recuperative sleep, your body can’t naturally heal itself, which means your discomfort is likely to return the next day, the day after that, and so on. Break this cycle by making an effort to embrace more productive sleep habits. Even when you’re getting enough rest, added pressure on joints and muscles supporting your spine can affect parts of your back. Therefore, it’s not surprising that one out of three sleepers regularly wakes up with back or neck pain. Spending several hours sleeping with a twisted spine can result in a wide range of discomfort, from sore muscles to persistent back pain. Fortunately, anyone experiencing stiff and sore back muscles in the morning may be able to find relief by adjusting his or her sleeping position. Consider the following tips for sleeping well if you’re living with back pain. Excessive tossing and turning isn’t good for your back. Instead, go to bed when you’re actually tired. Doing light exercise before bed may help with this goal. Once you discover your natural sleep time (listen to your body, as it will develop a natural rhythm), try to stick to that schedule. Whether it’s turning up the heat a notch, putting the AC on, or opening a window, keeping the room comfortable makes it easier to drift off to sleep. If you need some soft background noise, run a fan, which also keeps the room from becoming stuffy. Ginger and mint are just a few of the ingredients thought to contribute to the soothing effects of herbal tea. It’s also wise to avoid carbonated beverages, coffee, and alcohol before bed. Going to bed stressed isn’t going to make it any easier to fall asleep. Keep a journal or diary so you can write down your worries and get negative thoughts off your mind. Take a few moments to focus your thoughts on something peaceful. If you need some help, try a relaxing sound machine or some tranquil sound apps to put you in the right frame of mind. Sleeping on the right mattress is important regardless of your preferred position, with medium-firm being the standard recommendation. Boost your bedtime ergonomics by placing a pillow between your knees to minimize alignment issues when sleeping on your side. Your head pillow should keep your neck and spine in natural alignment, and your spine will thank you if you avoid stomach sleeping. If you can’t break the stomach sleeping habit, opt for a flatter pillow. By far, the worst sleep style for your back is on your stomach. When you’re in this position, it’s nearly impossible for your spine to remain in a neutral position thanks to gravity. Stomach sleeping can also irritate nerves and aggravate joint inflammation, and the lower back vertebrae are compressed for hours at a time. In addition, your head could end up twisted to the side so the upper spine is also stressed. Some stomach sleepers find it very difficult to change this lifelong habit, but they’ll find the effort worthwhile if it proves to reduce their back pain. The fetal position should also be avoided, since it places the spine into a curve. The result is a lot of added stress on your backbone and adjacent joints and muscles. If you really can’t avoid this position, try to minimize curling, and choose a plump pillow to help with head-spine alignment. A neutral sleeping position isn’t entirely flat. Ideally, sleep in a way that takes pressure off your spine while also allowing some degree of support. Sleeping on your back or side may be best for your back. While excessive tossing and turning isn’t necessarily good for your back, most natural sleep movements are beneficial. Even making a semiconscious effort to turn to your side or ease onto your back can minimize back pain. One of the best sleeping positions for avoiding back pain is on your side, with legs together. For many people with back pain, this position also happens to be the most comfortable, and they’ve already formed a habit of sleeping on the right or left side. Sleeping on your side places little stress on the body, and the pelvis is situated naturally. Sleeping on the back is also a healthy option when certain adjustments are made. Back sleepers shouldn’t use a pillow that forces the head into an unnatural position. A pillow that supports the neck without elevating the head enough to bend the spine upward is ideal. The legs should also be kept straight, without one knee or the other bending outward. If you’ve had spinal surgery, make sure to follow your doctor’s advice as you recover, especially if you’ve had a procedure such as kyphoplasty surgery. Beverly Hills patients should expect the first few days in their own beds after spine surgery to be somewhat difficult. In addition to being fatigued from some of the medications you’re likely to be given, there’s the added challenge of finding a position that doesn’t present a risk of reinjury while sleeping. Mattresses that are firm or medium-firm tend to provide the right level of post–spine surgery support. If your mattress is too soft, consider using a latex mattress pad to add some firmness to your bed. Avoid or limit daytime naps to ensure you’re tired enough to get a good night’s sleep. Being naturally sleepy when you’re ready for bed can make it easier to get more productive sleep following spine surgery, which also helps with healing. Side sleeping isn’t a good idea immediately after spine surgery. However, stomach sleeping is an acceptable variation, as long as you place a pillow between your knees for added support. Sleeping in a reclining chair for the first few days after coming home or using an adjustable bed can also minimize discomfort. Everyone needs to be comfortable while sleeping, but the correct sleeping position can prevent a sore back and offer more comfort while you’re awake. If you have chronic back pain that you believe is caused by your sleeping position, it might be time to talk with a spinal specialist. If you need personal guidance on how to sleep well with spinal pain, make an appointment today with a Beverly Hills spine surgeon, who will be able to make a personalized diagnosis and devise a customized treatment plan to alleviate your back pain. Call on the spinal health experts at The Spine Institute, pioneering physicians who lead the industry in every aspect of neck and back health. Reach out to one of our friendly representatives today at 310-828-7757.